Some time ago, my brother bought us a stovetop smoker. This one, to be exact. We used it exactly once, to smoke some pork tenderloins. We neither burned the house down nor filled it with smoke, so I suppose the first experiment was largely successful. Except that the meat didn't taste particularly smoky. Recently, I got it in my head that I should put the smoker to use again, this time smoking some vegetables. The Fourth of July was coming up, and on that day we'd be eating beef burgers flavored with the smoke from the grill. 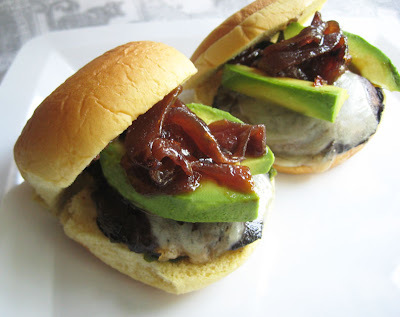 Portobello mushrooms make pretty good burger substitutes and I wondered if they'd be even better when smoked. Mushrooms, buns, and poblano peppers were purchased during our usual weekly trip to the grocery store and hung around in the fridge awaiting the weekend. And then Mother Nature struck, knocking out our power for four days. The mushrooms got packed up with the rest of the contents of fridge and freezer and were transported to Dad's place, where we lived until BGE got the electricity up and running (I think they saved our neighborhood for last). Rather than let the mushrooms dry out and go to waste, I chopped them up and used them to stretch a bit of frozen pasta sauce from our freezer (a bonus - doing so made for two fewer things to carry home later). Once we were back in our own digs, I was determined to make the smoked mushrooms, come hell or high water. (The temperatures around here sure did feel like hell.) I also smoked some thickly sliced onion that became a sweet and tangy jam for topping the mushroom burgers. I was pretty pleased with the results. While the smoked mushrooms would never fool a carnivore, they made for a fine meatless supper. Place mushrooms and onion in a stovetop smoker and smoke according to manufacturer's directions for about 15 minutes. Allow to cool inside smoker. When cool, remove mushrooms and set aside. Place onions in a saucepan to make the jam. Add a teaspoon or so of olive oil and a pinch of salt to the saucepan of smoked onions. Cook on medium heat, stirring often, until the onions start to wilt and become translucent, about 10 minutes. Stir in brown sugar and vinegar, turn heat to low, cover, and simmer an additional 20-30 minutes, until onions are very soft and have caramelized. If there's too much liquid left in the pot, raise the temperature and cook, uncovered, until the juices thicken. If the onions aren't smoky enough, stir in the smoked paprika. Heat a bit of olive oil in a large skillet and add mushrooms. Cook on both sides for a couple of minutes to heat through. Top with cheese in the last minute or so of cooking, if desired, and cover pan. Spread a bit of mayo on each side of a hamburger bun and add a few strips of pepper. Place one large or two small portobello caps onto the peppers. Top with avocado (tomato is nice, too) and a spoonful of onions.